This annual day of remembrance of the victims is observed by Jewish communities worldwide. This is a very important day on which to acknowledge that the Jewish Holocaust actually took place in history, engineered by a former Chancellor of Germany called Hitler. There are many people in the world who have taught and/or told that there is nothing like the holocaust ever in history. They have taught that it is all lies… It is a great shame indeed because if we, mankind do not learn and accept our history, how are we to understand our future? My family and I have watched a number of Holocaust Memorial Movies and found them to be very touching. We have not had a chance to visit the Holocaust Museums in Germany and Poland but pray that ABBA YAHUVEH ELOHIM will make a way one day in the near future in YAHUSHUA’S NAME, AMEN! The full name of the day commemorating the victims of the Holocaust is “Yom Hashoah Ve-Hagevurah“– literally the “Day of (Remembrance of) the Holocaust and the Heroism.” It is marked on the 27th day in the month of Nisan — a week after the seventh day of Passover, and a week before Yom Hazikaron (Memorial Day for Israel’s fallen soldiers). On January 30, 1933, Adolf Hitler was named chancellor, the most powerful position in the German government, by the aged President Hindenburg, who hoped Hitler could lead the nation out of its grave political and economic crisis. Hitler was the leader of the right-wing National Socialist German Workers Party (called “the Nazi Party” for short). It was, by 1933, one of the strongest parties in Germany, even though — reflecting the country’s multiparty system — the Nazis had won only a plurality of 33 percent of the votes in the 1932 elections to the German parliament (Reichstag). Once in power, Hitler moved quickly to end German democracy. He convinced his cabinet to invoke emergency clauses of the constitution that permitted the suspension of individual freedoms of press, speech, and assembly. Special security forces — the Gestapo, the Storm Troopers (SA), and the SS — murdered or arrested leaders of opposition political parties (Communists, socialists, and liberals). The Enabling Act of March 23, 1933 — forced through the Reichstag already purged of many political opponents –gave dictatorial powers to Hitler. Also in 1933, the Nazis began to put into practice their racial ideology. The Nazis believed that the Germans were “racially superior” and that there was a struggle for survival between them and inferior races. They saw Jews, Roma (Gypsies), and the handicapped as a serious biological threat to the purity of the “German (Aryan) Race,” what they called the master race. Jews, who numbered about 525,000 in Germany (less than one percent of the total population in 1933) were the principal target of Nazi hatred. The Nazis identified Jews as a race and defined this race as “inferior.” They also spewed hate-mongering propaganda that unfairly blamed Jews for Germany’s economic depression and the country’s defeat in World War I (1914-1918). In 1933, new German laws forced Jews out of their civil service jobs, university and law court positions, and other areas of public life. In April 1933, laws proclaimed at Nuremberg made Jews second-class citizens. These Nuremberg Laws defined Jews, not by their religion or by how they wanted to identify themselves, but by the religious affiliation of their grandparents. Between 1937 and 1939, new anti-Jewish regulations segregated Jews further and made daily life very difficult for them. Jews could not attend public schools; go to theaters, cinema, or vacation resorts; or reside or even walk in certain sections of German cities. Also between 1937 and 1939, Jews increasingly were forced from Germany’s economic life. The Nazis either seized Jewish businesses and properties outright or forced Jews to sell them at bargain prices. In November 1938, the Nazis organized a riot (pogrom), known as Kristallnacht (the “Night of Broken Glass”). This attack against German and Austrian Jews included the physical destruction of synagogues and Jewish-owned stores, the arrest of Jewish men, the vandalization of homes, and the murder of individuals. Another consequence of Hitler’s ruthless dictatorship in the 1930s was the arrest of political opponents and trade unionists and others whom the Nazis labeled “undesirables” and “enemies of the state.” Some 5,000 to 15,000 homosexuals were imprisoned in concentration camps; under the 1935 Nazi-revised criminal code, the mere denunciation of a man as “homosexual” could result in arrest, trial, and conviction. Jehovah’s Witnesses, who numbered at least 25,000 in Germany, were banned as an organization as early as April 1933, because the beliefs of this religious group prohibited them from swearing any oath to the state or serving in the German military. Their literature was confiscated, and they lost their jobs, unemployment benefits, pensions, and all social welfare benefits. Many Witnesses were sent to prisons and concentration camps in Nazi Germany, and their children were sent to juvenile detention homes and orphanages. 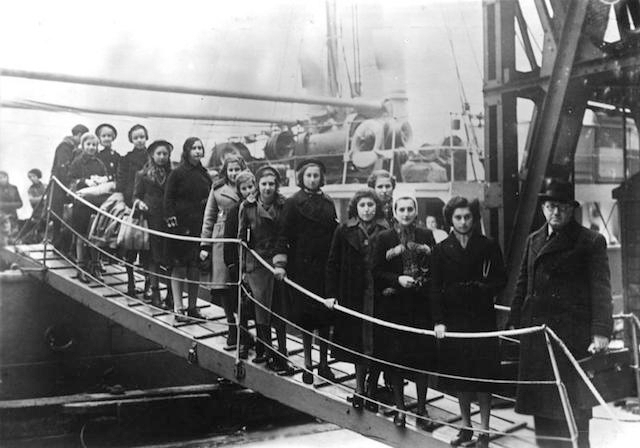 Arrival of Jewish refugee children, port of London, February 1939. Between 1933 and 1936, thousand of people, mostly political prisoners, were imprisoned in concentrations camps, while several thousand German Roma were confined in special municipal camps. The first systematic round-up of German and Austrian Jews occurred after Kristallnacht, when approximately 30,000 Jewish men were deported to Dachau and other concentration camps, and several hundred Jewish women were sent to local jails. The wave of arrests in 1938 also included several thousand German and Austrian Roma. Between 1933 and 1939, about half of the German-Jewish population and more than two-thirds of Austrian Jews (1938-1939) fled Nazi persecution. They emigrated mainly to the United States, Palestine, elsewhere in Europe (where many would be later trapped by Nazi conquests during the war), Latin America, and Japanese-occupied Shanghai(which required no visas for entry). Jews who remained under Nazi rule were either unwilling to uproot themselves or unable to obtain visas, sponsors in host countries, or funds for emigration. Most foreign countries, including the United States, Canada, Britain, and France, were unwilling to admit very large numbers of refugees. What happened in the 1940s in the Second World War is hard to forget and in fact should never be forgotten. Even those who are not Jews and/or practising the Jewish faith have visited the Holocaust Museums and found it was too much for them to bear. Some stopped before they could see everything and when the time came to visit another Holocaust Memorial Camp, they asked their friends to go in while they waited outside. The Second World War started in the Spring of 1944 and last 4 years after which what was known then as Palestine was declared as the “State of Israel.” When this happened, all Jews around the world started to try and return there so as to be at home, practise their faith without fear of persecution, etc. It is reported that 6 million Jews were murdered during the European Holocaust. 11/2 million Jewish children were killed. 666 million Orthodox and Messianic Jews will be killed in the future Holocaust during tge Great Tribulation. Anybody who insists after the Worldwide Mandatory Sunday Law that the day of worship is Saturday or any other day will be searched for and if caught, will be tortured and murdered brutally plus mercilessly. The focus is and will be on the Jews. Statistical and numerical data presented in the table below (https://en.m.wikipedia.org/wiki/List_of_Nazi_concentration_camps) originates from a wide variety of publications and therefore does not constitute a representative sample of the total. The Ghettos in German-occupied Europeare generally not included in this list. Relevant information can be found at the separate List of Nazi-era ghettos. 50 Oranienburg Germany Early concentration camp Mar 1933 – Jul 1934 3,000 16 min. The following information is copied from Wikipedia for awareness purposes. Yom HaZikaron laShoah ve-laG’vurah (יום הזיכרון לשואה ולגבורה; “Holocaust and Heroism Remembrance Day”), known colloquially in Israel and abroad as Yom HaShoah (יום השואה) and in English as Holocaust Remembrance Day, or Holocaust Day, is observed as Israel’s day of commemoration for the approximately six million Jews and five million others who perished in the Holocaust as a result of the actions carried out by Nazi Germany and its accessories, and for the Jewish resistance in that period. In Israel, it is a national memorial day and public holiday. It was inaugurated on 1953, anchored by a law signed by the Prime Minister of Israel David Ben-Gurion and the President of Israel Yitzhak Ben-Zvi. It is held on the 27th of Nisan (April/May), unless the 27th would be adjacent to Shabbat, in which case the date is shifted by a day. Yom HaShoah begins at sundown on Wed, 11 April 2018. In 1951, the Knesset began deliberations to choose a date for Holocaust Remembrance Day. On 12 April 1951, after also considering as possibilities the Tenth of Tevet, the 14th of Nisan, which is the day before Passover and the day on which the Warsaw Ghetto Uprising (April 19, 1943) had begun, and September 1, the date on which the Second World War had begun, the Knesset passed a resolution establishing the 27 Nisan in the Hebrew calendar, a week after Passover, and eight days before Israel Independence Day as the annual Holocaust and Ghetto Uprising Remembrance Day. On 3 May 1951, the first officially organized Holocaust Remembrance Day event was held at the Chamber of the Holocaust on Mount Zion; the Israel Postal Serviceissued a special commemorative envelope, and a bronze statue of Mordechai Anielewicz, the leader of the Warsaw Ghetto revolt, was unveiled at Yad Mordechai, a kibbutz named for him. From the following year, the lighting of six beacons in memory of the six million Jews killed by the Nazis became a standard feature of the official commemoration of Holocaust Memorial Day. On 8 April 1959, the Knesset officially established the day when it passed the Martyrs’ and Heroes’ Remembrance Day Law with the purpose of instituting an annual “commemoration of the disaster which the Nazis and their collaborators brought upon the Jewish people and the acts of heroism and revolt performed.” The law was signed by the Prime Minister of Israel, David Ben-Gurion, and the President of Israel, Yitzhak Ben-Zvi. It established that the day would be observed by a two-minute silence when all work would come to a halt throughout the country, memorial gatherings and commemorative events in public and educational institutions would be held, flags would be flown at half mast, and programs relevant to the day would be presented on the radio and in places of entertainment. An amendment to the law in 1961 mandated that cafes, restaurants and clubs be closed on the day. Yom HaShoah opens in Israel at sundown in a state ceremony held in Warsaw Ghetto Square at Yad Vashem, the Holocaust Martyrs’ and Heroes Authority, in Jerusalem. During the ceremony the national flag is lowered to half mast, the President and the Prime Minister both deliver speeches, Holocaust survivors light six torches symbolizing the approximately six million Jews who perished in the Holocaust and the Chief Rabbis recite prayers. On Yom HaShoah, ceremonies and services are held at schools, military bases and by other public and community organizations. On the eve of Yom HaShoah and the day itself, places of public entertainment are closed by law. Israeli television airs Holocaust documentaries and Holocaust-related talk shows, and low-key songs are played on the radio. Flags on public buildings are flown at half mast. At 10:00, an air raid siren sounds throughout the country and Israelis are expected to observe two minutes of solemn reflection. Almost everyone stops what they are doing, including motorists who stop their cars in the middle of the road, standing beside their vehicles in silence as the siren is sounded. Observance of the day is moved back to the Thursday before, if 27 Nisan falls on a Friday (as in 2008), or forward a day, if 27 Nisan falls on a Sunday (to avoid adjacency with the Jewish Sabbath). The fixed Jewish calendar ensures 27 Nisan does not fall on Saturday. Jewish communities and individuals throughout the world commemorate Yom HaShoah in synagogues as well as in the broader Jewish community. Many hold their commemorative ceremonies on the closest Sunday to Yom HaShoah as a more practical day for people to attend, while some mark the day on 19 April, the anniversary of the Warsaw Ghetto uprising. Jewish schools also hold Holocaust-related educational programs on or near Yom HaShoah. Commemorations typically include memorial services and communal vigils and educational programs. These programs often include talks by Holocaust survivors (although this is becoming less common as time passes and there are fewer survivors who remain alive), candle-lighting ceremonies, the recitation of memorial prayers, the Mourner’s Kaddishand appropriate songs and readings. Some communities read the names of Holocaust victims or show Holocaust-themed films. Since 1988 in Poland, a memorial service has been held after a 3-kilometer walk by thousands of participants from Auschwitz to Birkenau in what has become known as “The March of the Living” . In response to the lack of liturgy dedicated to Yom HaShoah, Daniel Gross composed, in 2009, I Believe: A Shoah Requiem, a complete musical liturgy dedicated to the observance of Yom HaShoah. An a cappella oratorio scored for cantor, soprano solo, adult chorus and children’s chorus, I Believe features several traditional prayer texts such as the Mourner’s Kaddish (Kaddish Yatom) and the El Malei memorial prayer, and also includes the poetry of Paul Celan and Primo Levi. On April 7, 2013, I Believe had its world premierepresentation at Orchestra Hall at the Max M. Fisher Music Center in Detroit, Michigan. While there are Orthodox Jews who commemorate the Holocaust on Yom HaShoah, others in the Orthodox community, especially Haredim, including Hasidim, remember the victims of the Holocaust on traditional days of mourning which were already in place before the Holocaust, such as Tisha B’Av in the summer, and the Tenth of Tevet in the winter, because in the Jewish tradition the month of Nisan is considered a joyous month associated with Passover and messianic redemption. Some ultra-Orthodox rabbis recommend adding piyyutim (religious poems) written by contemporary rabbis to the liturgy of Tisha B’Av; some adherents follow this advice. In 1981, members of the Federation of Jewish Men’s Clubs FJMC, a branch of the mainstream Conservative/Masorti movement, created a special memorial project specifically for Yom HaShoah. A dedicated yahrzeit candle was conceived, with yellow wax and a barbed-wire Star of David logo reminiscent of the armbands Jews were forced to wear during the Holocaust. This object has come to be known as the Yellow Candle (TM). Approximately 200,000 candles are distributed around the world each year, along with relevant prayers and meditations. In 1984, Conservative Rabbi David Golinkinwrote an article in Conservative Judaismjournal suggesting a program of observance for the holiday, including fasting. In his article he noted that while private fasts are indeed prohibited during the month of Nisan (a major Orthodox objection to the placement of the day), communal fasts for tragedies befalling Jewish communities had indeed been declared throughout the pre-Modern period. Another prominent Conservative Jewish figure shared the Orthodox sentiment about not adopting Yom HaShoah. Ismar Schorsch, former Chancellor of Conservative Judaism‘s Jewish Theological Seminary of America held that Holocaust commemoration should take place on Tisha b’Av. The Masorti (Conservative) movement in Israel has created Megillat HaShoah, a scroll and liturgical reading for Yom HaShoah. This publication was a joint project of Jewish leaders in Israel, the United States and Canada. In 2011, the FJMC introduced a related Yellow Candle concept for use on Kristallnacht (The Night of Shattered Glass) and other important Shoah commemoration dates. Called the Ner Katan, FJMC’s new version consists of six Yellow Candles provided for communal observances and ceremonies. More recently Conservative rabbis and lay leaders in the US, Israel and Canada collaborated to write Megillat Hashoah (The Holocaust Scroll). It contains personal recollections of Holocaust survivors. A responsa was written by Rabbi David Golinkin expressing the view that not only is it legitimate for the modern Jewish community to write a new scroll of mourning, it was also incumbent to do so. Reform Jewish congregations have tended to commemorate the memory of the Holocaust either on International Holocaust Remembrance Day or on Yom HaShoah. These commemorations of the Holocaust have used a ceremony that is loosely modeled after a Passover Seder. The focus of the seder has changed with time. The earlier Holocaust seders commemorated the losses of the Holocaust through a reenactment events from the Holocaust and through the lighting of six yahrzeit candles to reflect the approximately 6 million Jews murdered.More modern Haggadot for Yom HaShoah, such as Gathering from the Whirlwind, have concentrated on renewal, remembrance, and the continuity of Jewish life. In 1988 the American Reform movement published Six Days of Destruction (Elie Wiesel and Rabbi Albert Friedlander). Narratives from Holocaust survivors are juxtaposed with the six days of creation found in Genesis. ^ Jump up to:a b “Remembrance Day Calendar”. United States Holocaust Memorial Museum. Retrieved April 15, 2015. ^ Jump up to:a b c d Gilad, Elon (27 April 2014). “The History of Holocaust Remembrance Day”. Ha’Aretz. Retrieved17 January 2018. Jump up^ Naor, Mordechai (1998). “1951”. The Twentieth Century in Eretz Israel. Translated by Krausz, Judith (English ed.). Cologne, Germany: Konenmann Verlagsgesellschaft mbH. pp. 299–300. ISBN 9783895085956. Jump up^ “Marking Yom HaShoah: Calendars And Memory, God And History”. The New York Jewish Week. Retrieved April 23,2017. Jump up^ “Martyrs’ and Heroes’ Remembrance Day Law” [English translation] (PDF). Sefer Ha-Hukkim (in Hebrew). Jerusalem, Israel: The Knesset (No. 280): 112. 17 April 1959. Retrieved17 January 2018. Jump up^ In the Jewish calendar the day begins in the evening and ends in the following evening. Jump up^ “Holocaust Martyrs’ and Heroes’ Remembrance Day, April 18–19, 2012”. Yad Vashem. Retrieved April 20, 2012. Jump up^ Schechter, Jack (2014). Journey of a Rabbi: Vision and Strategies for the Revitalization of Jewish Life. UPA. p. 464.ISBN 9780761863991. Jump up^ “Siren brings Israel to a halt as country marks Holocaust Remembrance Day”. The Jerusalem Post | JPost.com. Retrieved April 23, 2017. Jump up^ Harman, Danna (April 28, 2014). “WATCH: Israelis Pause in Silence as Siren Sounds for Holocaust Remembrance Day”. Haaretz. Retrieved April 23, 2017. Jump up^ “Yom Hashoah: Holocaust Memorial Day”. My Jewish Learning. 2018. Retrieved 17 January 2018. ^ Jump up to:a b “Jewish Holidays: Yom HaShoah – Holocaust Memorial Day”. Jewish Virtual Library. 2018. Jump up^ “Thousands walk from Auschwitz to Birkenau in March of the Living”. Jerusalem Post. May 5, 2016. RetrievedApril 23, 2017. Jump up^ “About the March”. March of the Living. Retrieved17 January 2018. Jump up^ “Yom Hashoah: Holocaust Memorial Day”. My Jewish Learning. Retrieved April 23, 2017. Jump up^ Feinstein, Moshe (1996). Igros Moshe, Volume 8, Yoreh Deah, Siman 57. New York. p. 289. Jump up^ “Holocaust Memorial Day (Yom Ha-Shoah)”. Jewish Virtual Library. 2011. Retrieved May 1, 2011. Jump up^ “Megillat HaShoah: The Holocaust Scroll”. Archived from the original on July 19, 2011. Jump up^ “A seder for Yom Hashoah”. washingtonjewishweek.com. Retrieved April 20, 2017. Jump up^ “Seder Yom Hashoah – Welcome”.http://www.sederyomhashoah.com. Retrieved April 20, 2017. Jump up^ “Gathering from The Whirlwind”. Jump up^ “Changing face of Holocaust education | TJP”.tjpnews.com. Retrieved April 20, 2017. Jump up^ Reporter, Janice Arnold, Staff (April 10, 2012). “Third seder created to commemorate Holocaust – The Canadian Jewish News”. The Canadian Jewish News. RetrievedApril 20, 2017. Jump up^ “Six Days of Destruction”. Science Direct. RetrievedApril 23, 2017. Jump up^ “Yom HaShoah”. Hebrew Calendar. Retrieved April 23,2017. 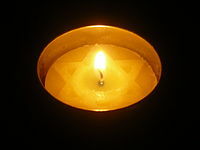 Wikimedia Commons has media related to Yom HaShoah. Moshe Yaalon, Holocaust Remembrance Day April 2007.